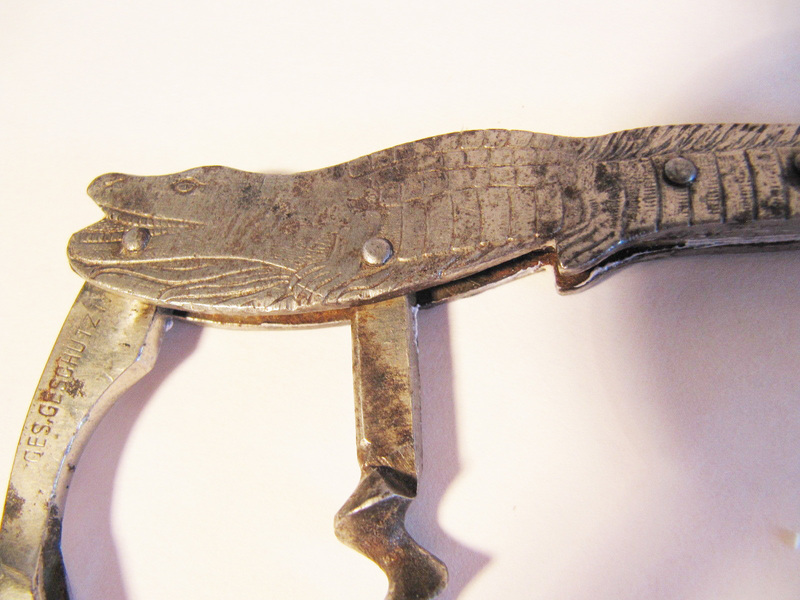 I placed the steel alligator next to his celluloid cousin in the corkscrew case. (I don’t have those either). 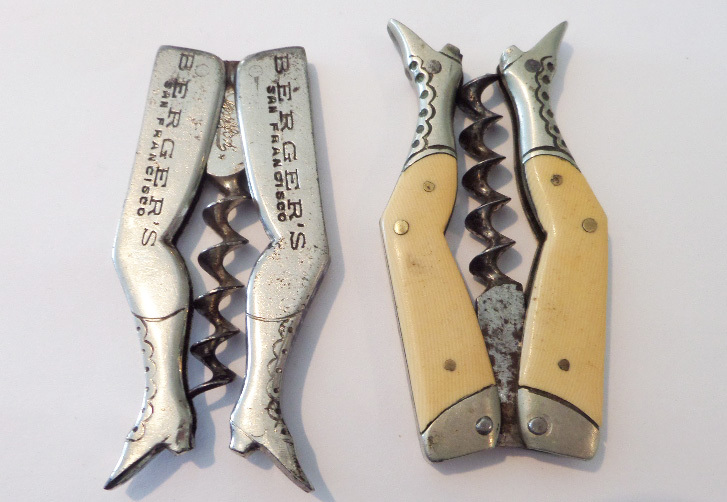 I know that are a myriad of materials used on folding corkscrews, and figural bottle corkscrews, but what other Celluloid and Steel examples are there. Is there a Steel pair of folding shoes. A steel folding lady? A celluloid version of the German Fish waiter? to announce that the steel alligator made it safely to his new home! 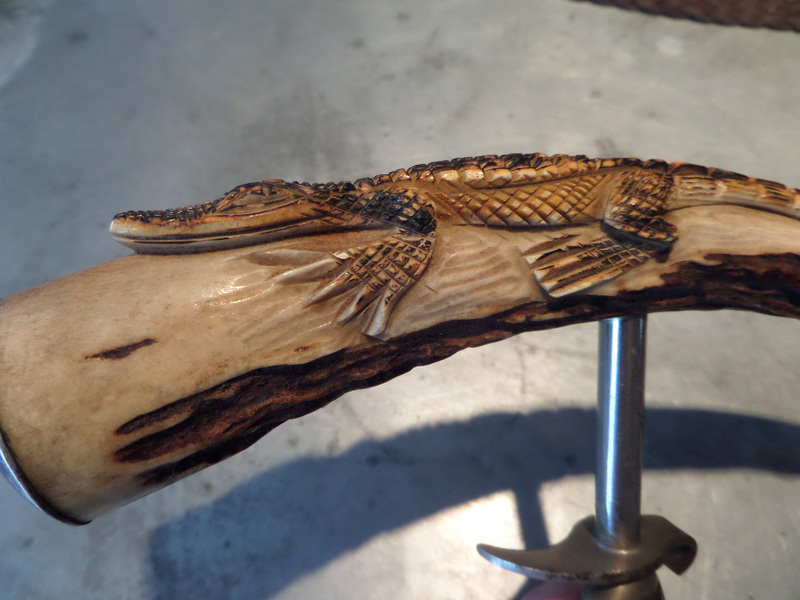 A decade or so ago, I got my first alligator carved corkscrew at a Flea Market outside of Chicago. And, shortly thereafter I picked up another carved alligator on eBay. 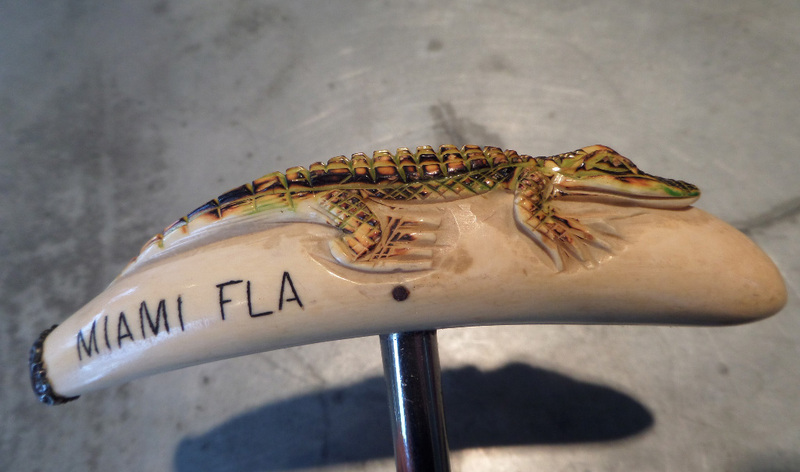 This one was quite handsome, and was polychromed and signed just under his tail with MIAMI, FLA.
Over the years a few others have come in the collection. A few have left the collection. 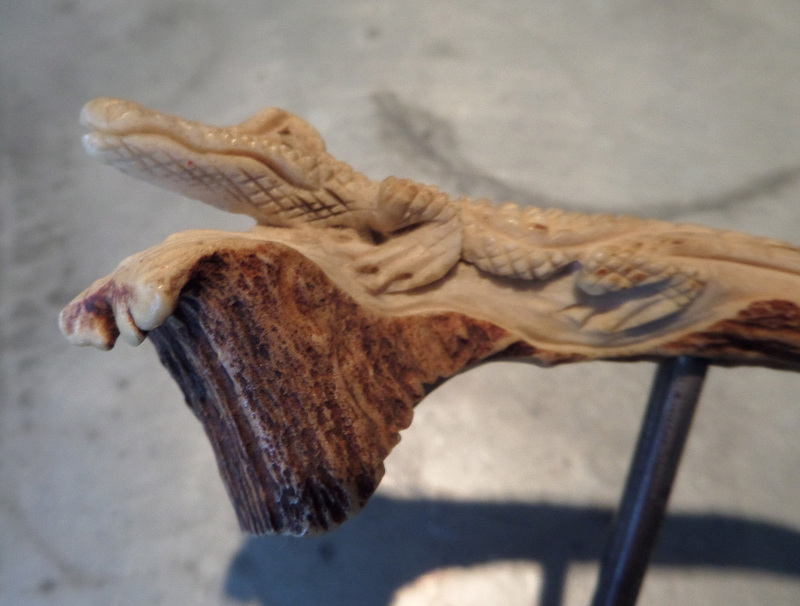 Still, there are currently three carved alligators in the (carved) corkscrew swamp. And, in a trade many years ago (coincidentally with the same collector who recently sold Tommy his extra large Syroco scotty dog) I received my first celluloid alligator. And, that one has never left the corkscrew swamp! 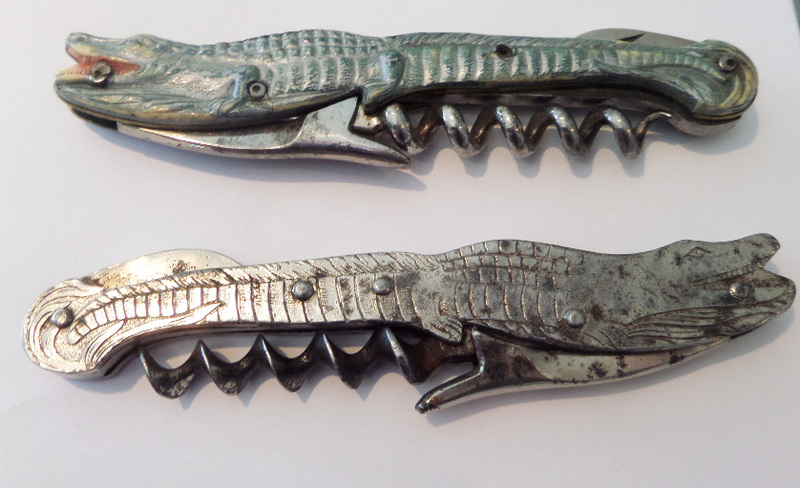 I have since had in my possession two other celluloid alligators, but whether traded away, or parted with at a corkscrew meeting, they have found other homes. As it happened, my second celluloid alligator was acquired through eBay. And, it was advertised as Steel. I paid for the item, which was picked up rather cheaply, and when it arrived it wasn’t steel at all. It was again (as mentioned) celluloid. Given the price, I had nothing to complain about. And, perhaps the listing itself was simply misunderstood. 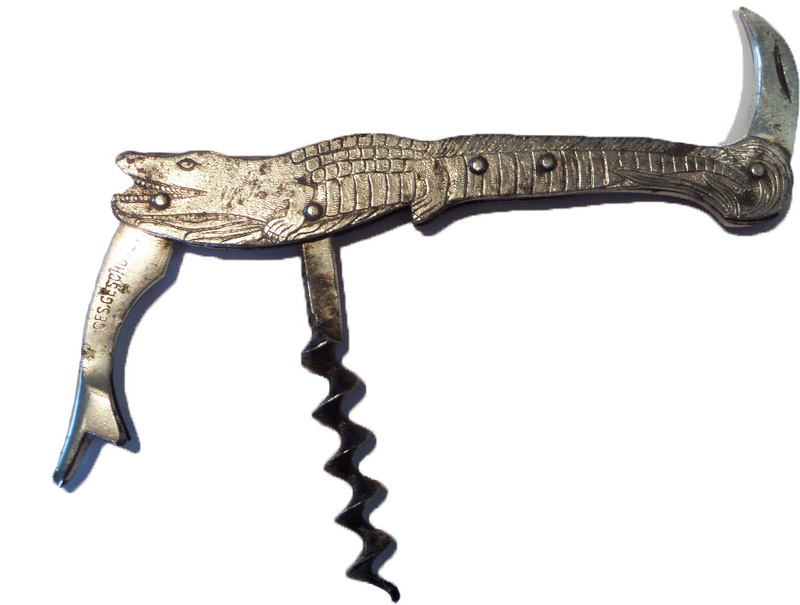 It was indeed an alligator, and the corkscrew was indeed steel, while the body wasn’t. That also was a while back, and that was the closest I have come to getting a steel version. Yes, there is always a big however. 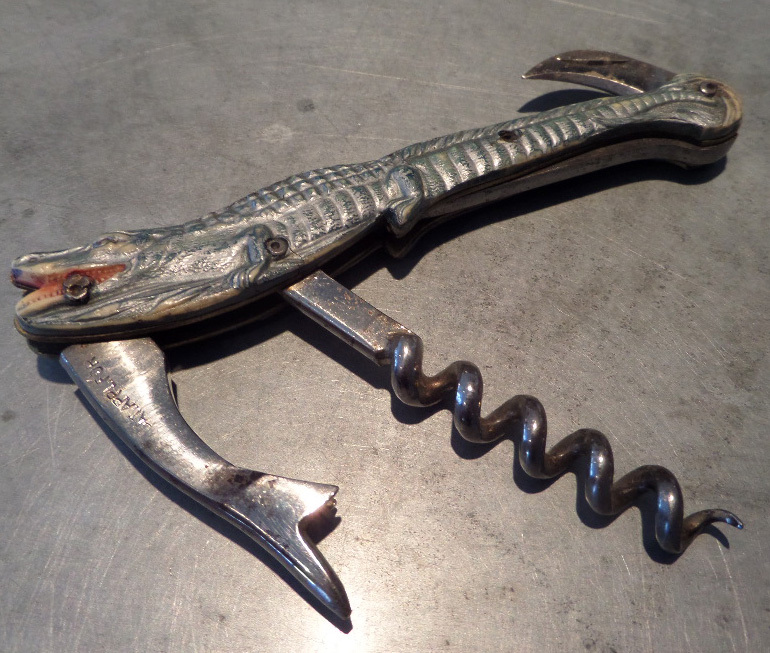 The other day, on our second favorite auction site, a listing for a “VINTAGE ALLIGATOR CROCODILE CORKSCREW WINE BOTTLE OPENER GES. GESCHUTZI GERMANY” had been put up. And, I was just checking in for the last time of the evening, before we headed out to hop on a skiff to cross the thoroughfare to North Haven for dinner. The pictures were rather dark, and without looking at condition, cracks in the body, or a potentially tipped worm, I clicked the buy it now option, which was original to the listing. After securing the purchase, and promptly paying the person who listed it. I revisited the pictures. As the pictures were so dark, I opened up photoshop, and began to lighten them a little. And, what should reveal itself? An excellent addition to the collection! 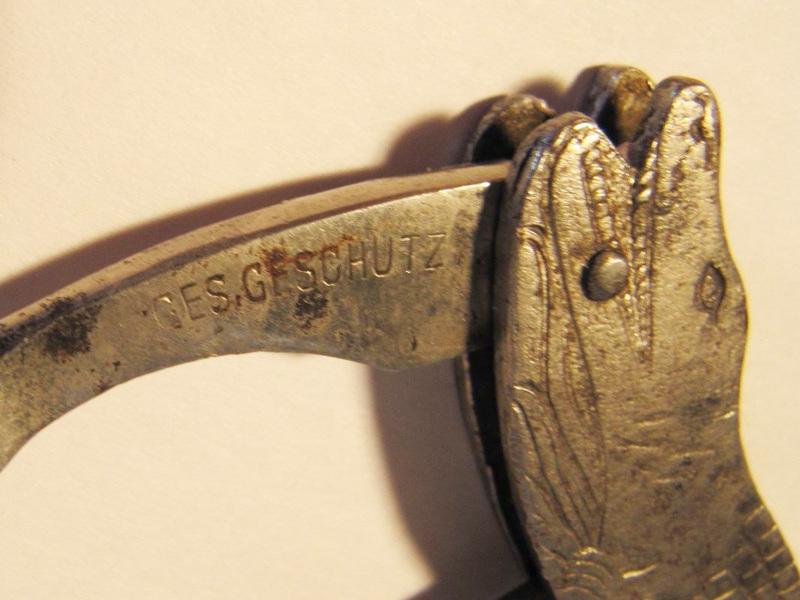 Several years ago, there was an unusual double lever with very long levers. It was early in my collecting, and with a low Buy it Now, I decided to take a chance. 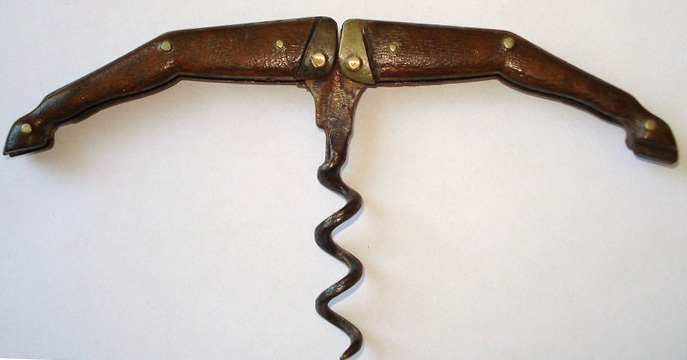 As it happened, at one of the corkscrew meetings that year, I was made a healthy offer for it, and I let it go. Last year, I managed to pick up another example. These have to be of relatively recent vintage–the last 40-50 years I would guess, but they just don’t turn up that often. The most recent example was also passed on to another collector. 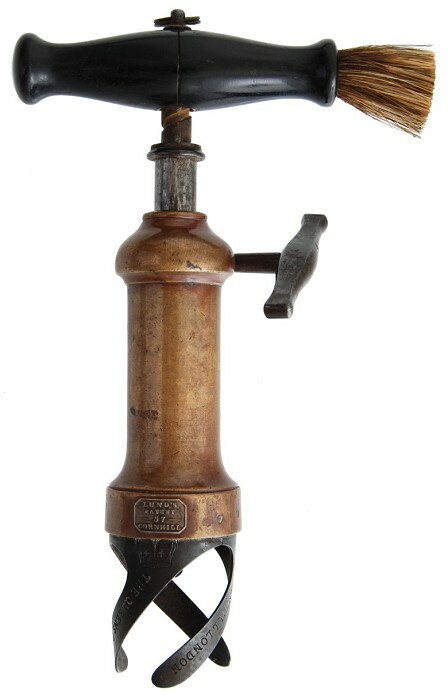 This afternoon, on one of my favorite antique buying sites (not eBay) another one was listed. But, this one was different, instead of the rounded design as the one pictured above, it has a different shape. Tommy had recently picked up the rounded Russian Double Lever, and messaged me to let me know he was interested. And, what the heck, it is all yours TC! 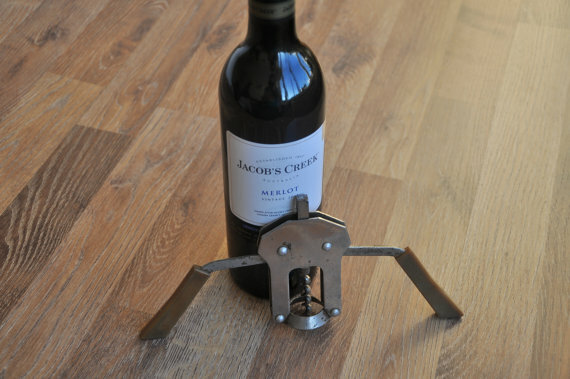 Of course, the corkscrew is being shipped from Latvia, so it might be a while before it arrives. 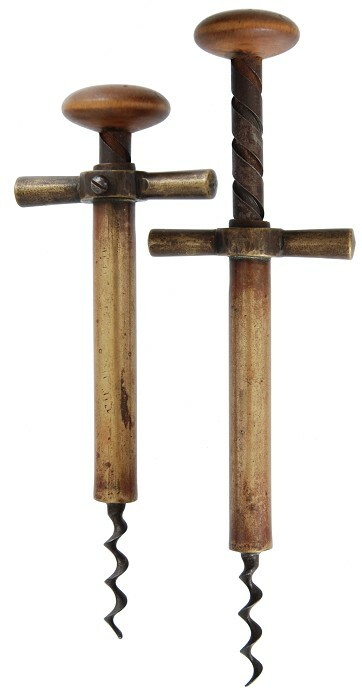 While these Russian corkscrews don’t turn up often, I have yet to see any background information on them. If you have any idea of maker or timeframe when these were produced, please drop me a line. They are indeed interesting–but it would be nice to know more about them. 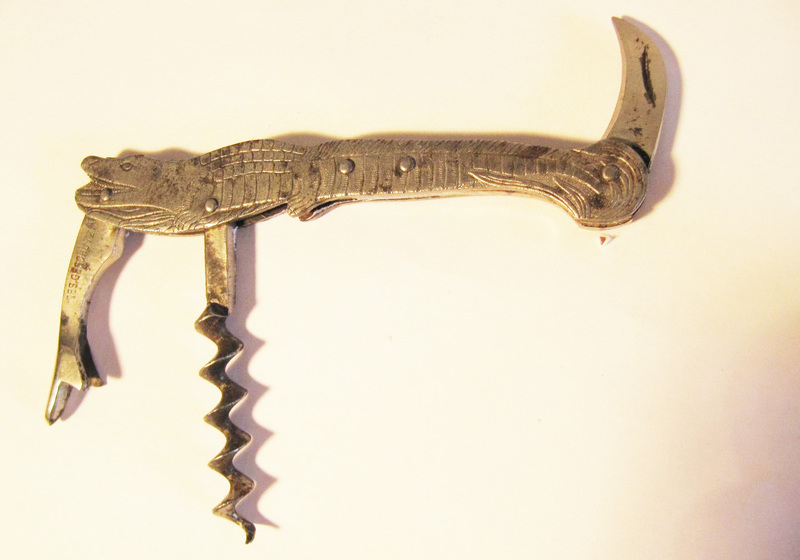 While there certainly have been a few corkscrews that have gotten collectors’ attention as of late, I have come to realize that I haven’t been doing much buying. 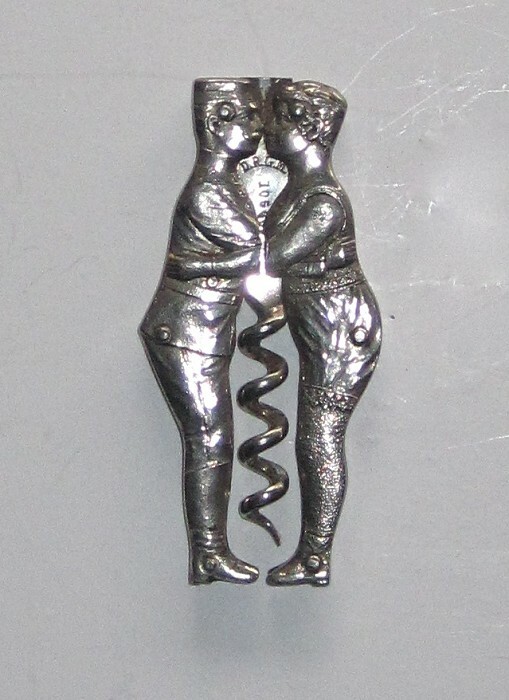 Of course, tomorrow the ICCAuction begins, and that will definitely provide a few corkscrews to tempt (and potentially drain) the paypal account. Still, I have picked up a corkscrew here and there. That said, this is the time of year when I start stockpiling beer and brewery openers in anticipation of the Just for Openers convention. While the meeting is a few months off, and I actually look for openers year round to bring for trade, over the last couple of days I have picked up one or two, and have been placing them in the potential TWJ-trade pile. 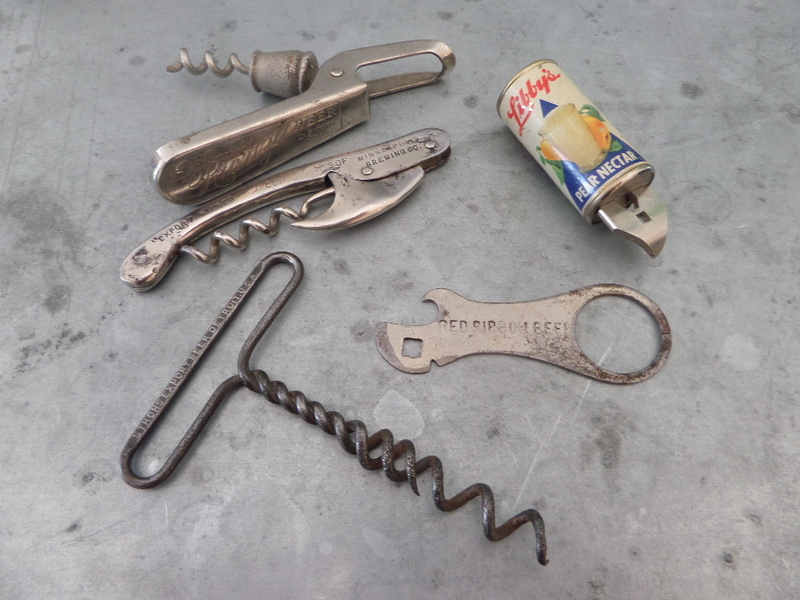 For now, it will be added to the growing pile of beer corkscrews and openers (oh, and one Libby’s Pear Nector opener). I also managed to get another Eldredge Brewing Williamson Bottle the other day. I should throw that in the TWJ pile as well. And, somewhere around the house is a whole box of openers that surely will make good trade bait. I just have to remember where I stashed them. 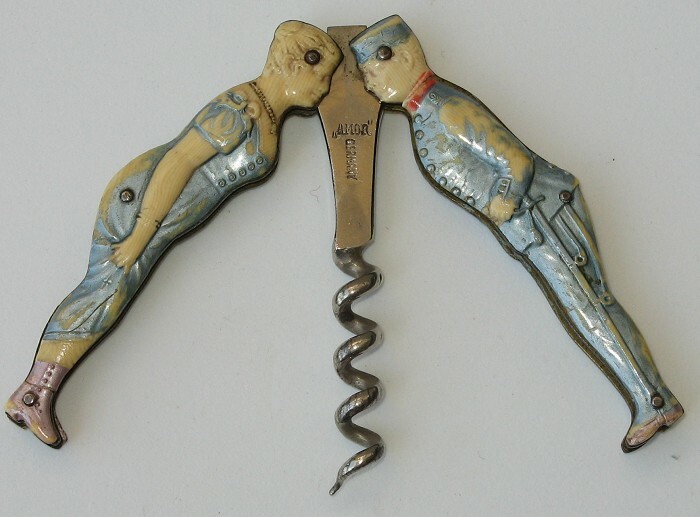 If you have any unusual corkscrews with brewery or beer advertising on them, drop me a line. I need to stockpile!!! 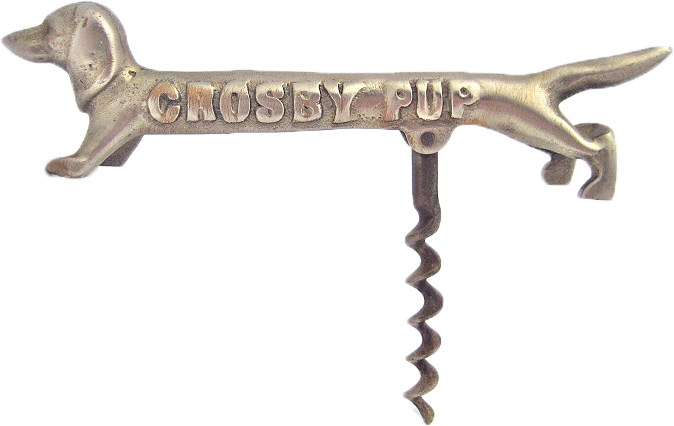 Several years ago, there was a list running of those collectors that had a Crosby Pup within their collections–of course, Bob Kimball has 7 or 8 of them, but most of have only one. However, over the years, the computer upon which the list was saved crashed. And, while there are copies of the list that other collectors have maintained, with pups that have changed hands through sales and trades, a small group of us are trying to rebuild the list. So… let’s see how many Crosby Pups we can account for! I have created a Facebook page for the Crosby Pup . And, I invite each of you to take a snapshot of your Crosby Pup and add it to the timeline. If you have more than one, add them both. If you aren’t a Facebook user, feel free to email crosbypup@gmail.com with your name and pic of your pup. Let’s see if we can account for the 50-60 that Bing was rumored to have given away! 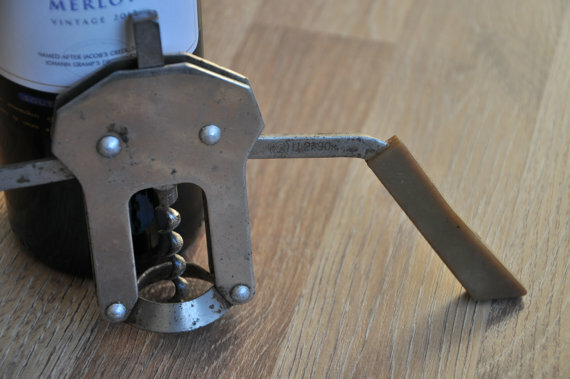 The Maud patent corkscrew arrived today, and I am quite pleased. Marked MAUD’S on one side, and PATENT on the other, it definitely is a contender for the Best 6 of 2014. 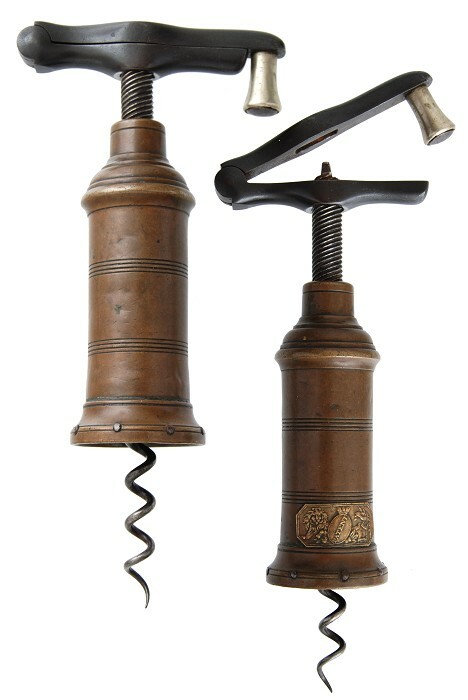 This invention relates to improvements in corkscrews; and its object is to enable corks to be drawn from the necks of beer, wine, and other bottles more readily than at present by causing the corks to be simply twisted from their beds or positions in the necks of the bottles with ease and safety, thereby reducing the liability of breakage either of the cork or neck of the bottle to a minimum and at the same time preventing the corkscrew pulling through the cork without drawing it. 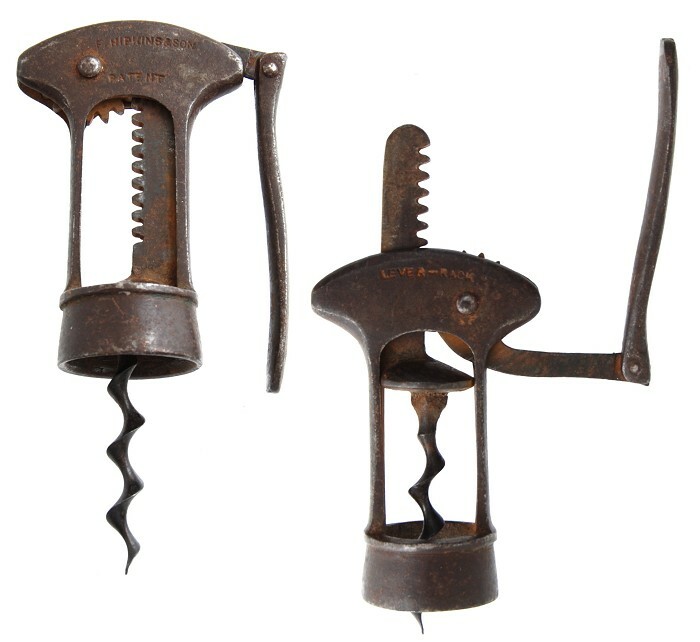 The above object is attained by combining with, say, an ordinary corkscrew, above its worm or twisted thread, an attachment consisting of a disk or washer capable of being automatically locked and unlocked by any convenient means with the stem or handle of the corkscrew, the said disk or washer being also armed on its under side with any desired number of pendent pins arranged to enter the top of the cork as the twisted thread or worm passes into and through it. A nice addition to the collection, and one I have been after for some time! 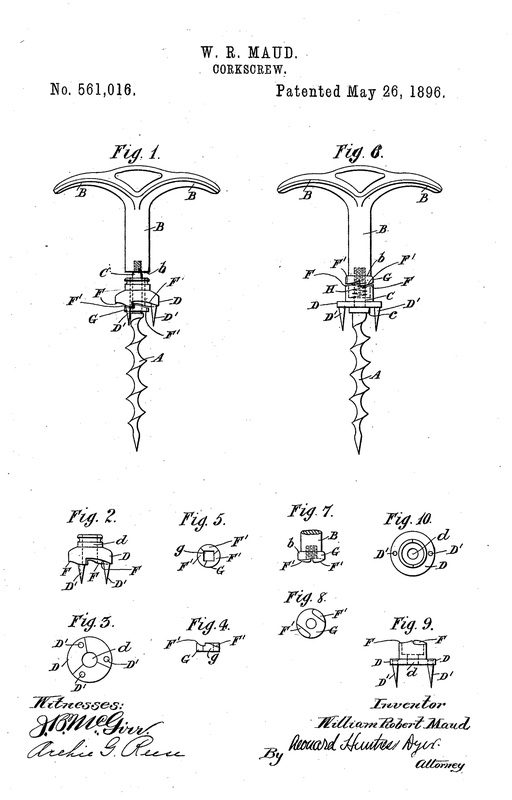 The Maud’s patent, still has yet to arrive… And, while I have cleared space in the American Corkscrew Patents department for its arrival, no such luck. 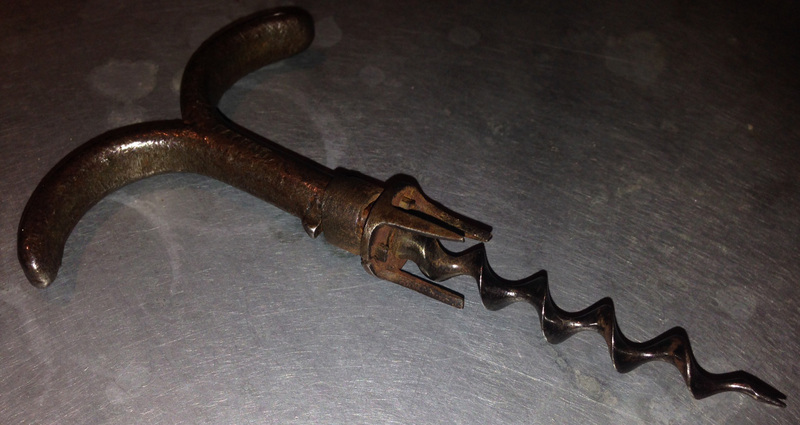 I did however, manage to pick up a nice little French corkscrew, and thus far, it is my big purchase of the week! Now, it is entirely possible that a corkscrew, or a bunch of corkscrews, or a collection of corkscrews, may be coming my way at any moment. But, for now, this is it. Of course, with the upcoming ICCAuction, opening up on January 25th, and the 300+ listings available on the Buy Now site, I am sure there will be some new additions very soon. I had got tail of a large Syroco Scotty dog corkscrew that a corkscrew collector in Rochester, NY had found. And, I was intrigued, as this guy knows his Syroco. 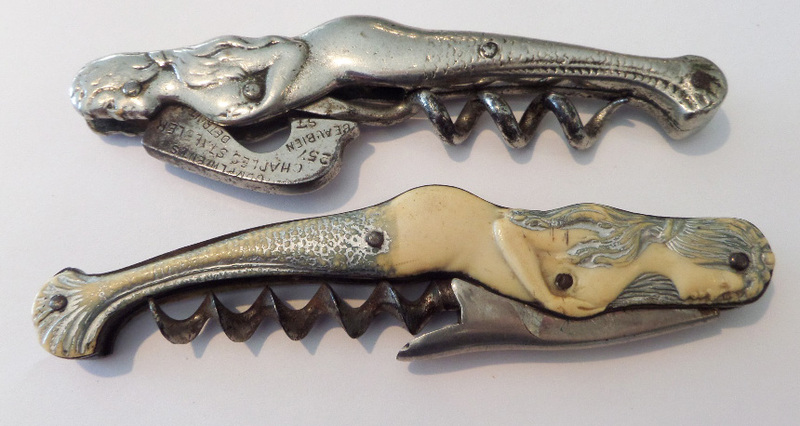 Early on in my collecting, he and I had exchanged emails and over the years many corkscrews had changed hands. I got my first Copperfield from him. And, I got my first Pickwick from him. There have been laughing men, dogs, country gentlemen. Living in that area of the country, he seems to find Syroco with certain regularity. And, so news of the Large Scotty dog had me intrigued. 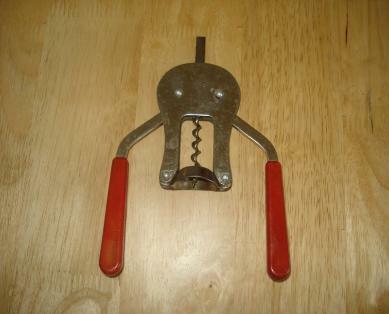 Still, I didn’t pursue the corkscrew. Tommy on the other hand, with his passion for Syroco, did contact our mutual collecting friend, and came to a deal. 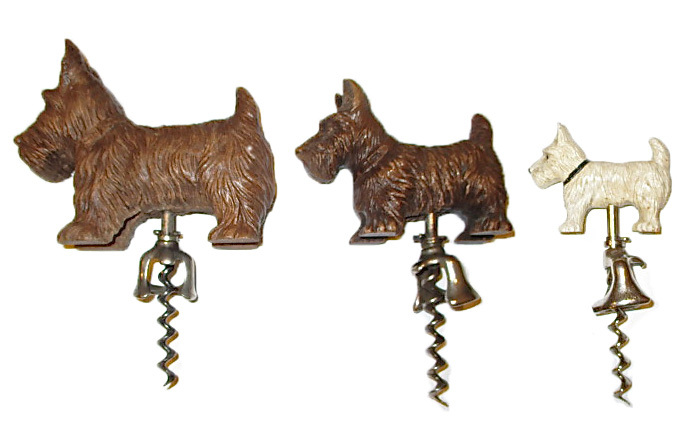 And, on Tommy’s blog the three sizes of Scotty are shown–and with a little help from Photoshop, you can see the size differences here. Given that we haven’t seen a Scotty corkscrew this large before, I am guessing it was an end of the day project by one of the workers. 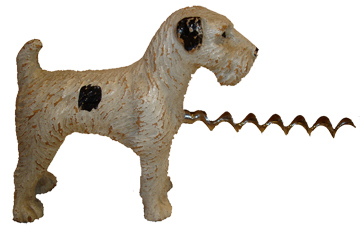 A few odd variations of Syroco corkscrews like this have turned up, for example this Syroco dog with corkscrew that protrudes from its chest–many of us have the small scotty dog with corkscrew in chest but this little guy? 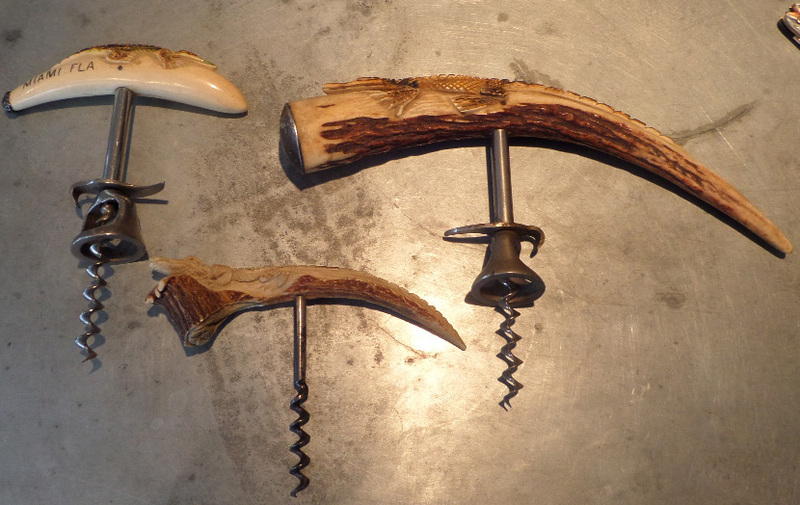 And, then there are those Syroco pieces that normally show up just as an opener; except the few odd elephants that turn up with a corkscrew. 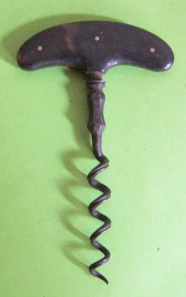 Congrats TC, an AWESOME corkscrew! But, maybe there is another large scotty corkscrew out there. Do you have one? And, moreover, what Syroco anomalies exist within your collection? Odd colorations of paint, a Old Codger with waaaaaaay too much rouge for example, etc. Feel free to send pictures, and I will post them here.